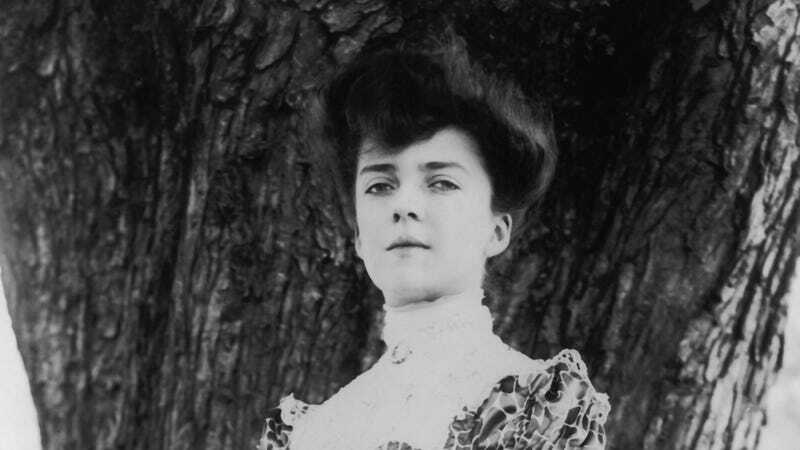 What it’s about: We can debate whether Jackie or Michelle was a more glamorous first lady, but it’s unlikely we’ll find a more captivating first daughter than Alice Roosevelt. Teddy’s only daughter from his first marriage entered the spotlight at age 17, when the assassination of William McKinley unexpectedly made her father president. The younger Roosevelt instantly became a fashion icon, gossip magnet, and polarizing figure for her outspokenness in an era when young women were expected to be demure. And her wild life continued long after she left the White House. Biggest controversy: There were many. Alice was a partier, a gambler, a smoker, and an all-around rule-breaker. Her father once said, “I can either run the country or I can attend to Alice, but I cannot possibly do both.” An overseas trip in 1905 turned scandalous. She co-led a diplomatic mission to four Pacific Rim countries and the recently acquired territory of Hawaii as an equal to then-Secretary Of War William Howard Taft. (No first daughter would be given that much authority until first daughter/real first lady/shadow president Ivanka Trump 112 years later.) While at sea, Alice jumped into the ship’s pool with her clothes on, inviting Congressman Nicholas Longworth to join her. (They latter married.) She later told Robert Kennedy she only would have considered it scandalous if she had taken off her clothes first. Strangest fact: The Roosevelts weren’t out of the White House long before Alice was banned from returning to the residence. Just before her father’s term expired, she buried a voodoo doll of incoming first lady Nellie Taft in the White House lawn. The Taft administration banned her from the grounds (whether for this or some other infraction isn’t made clear on Wikipedia). The Wilson administration did the same in 1916 for “a bawdy joke at Wilson’s expense.” Alice retaliated by campaigning against the League Of Nations, President Wilson’s pet project. While she didn’t vote for John F. Kennedy, she grew to admire “how amusing and attractive Democrats could be,” and struck up a friendship with his brother Robert. She voted for LBJ because she found his opponent Barry Goldwater too mean, but also became friends with Richard Nixon, and was invited to his first formal White House dinner (her ban from the premises had long since been lifted). Alice married a congressman from Ohio and eventual Speaker Of The House Nicholas Longworth after falling for him on that overseas trip. Longworth had a reputation as a womanizer, and had perhaps met an equal in Alice, as she had numerous affairs during their marriage. Their relationship soured in 1912, when she supported her father’s third-party run for president, and he supported his political mentor, incumbent President Taft. She even campaigned for her father’s ticket in Longworth’s own district, and when he lost by just 105 votes, she joked that she had cost him the election. Longworth no doubt found that less than funny. Their marriage suffered, and Alice started seeing other men on the side. She had a long-running affair with Republican Senator William Borah, who’s believed to be the father of her only child, Paulina. It seems to have been an open secret at the time, as Alice originally wanted to name her daughter Deborah (i.e., “de Borah”). Alice’s daughter’s life was tragic; she married and had a daughter, but her husband died of hepatitis five years later, and she herself died of an overdose of sleeping pills a few years after that. Alice raised her orphaned granddaughter, Joanna, and the two “were very close.” Alice survived breast cancer twice, and lived to the ripe old age of 96. Her last public appearance was at the U.S. Bicentennial, 75 years after she moved into the White House. Best link to elsewhere on Wikipedia: In her first public appearance as first daughter, Alice stunned Washington crowds with a pale blue gown that made her an instant trendsetter. The gown’s color was forever after known as Alice Blue, a color that the Navy still uses in the trim of any ship named after Teddy Roosevelt, and was one of the colors in the world wide web’s original color set. Further down the Wormhole: One of Theodore Roosevelt’s many lasting legacies was building a canal across Panama, which he convinced Congress to pursue over an alternate site in Nicaragua. Cuisine on that country’s Caribbean coast often features coconut, which grows virtually anywhere in the world that’s tropical and close to the water. Besides being a source of food, water, and oil, the fruit of the coconut palm also kills roughly 30 times more people than sharks. We’ll look at one of the less dignified ways to die—death by coconut—next week.